It is recommended that you try to get your universes and the Query Panel to generate the correct SQL, but in some instances it is not possible for this to take place. This could be due to design of the universe(s) or maybe lack of functionality in the Query Panel to generate advanced SQL statements. 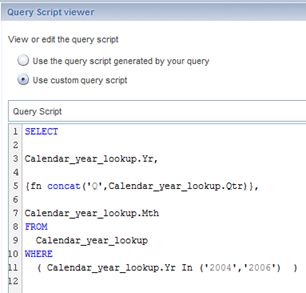 This session looks at how you can use the Web Intelligence Query Panel to manually alter SQL statements generated when using universes as data sources. We will use this session to demonstrate the concepts of reading and modifying SQL statements, but it is assumed you are already familiar or experienced with SQL statements.